Having had a poor start in their quest to win the 2018 Cosafa Cup title, hosts South Africa were presented with a chance to lift the Plate trophy. Coach Stuart Baxter’s men faced Botswana in the final on Friday afternoon at the New Peter Mokaba hoping to bring back the smiles to their fans. The hosts were looking to continue winning after a disappointing 4-3 penalty shoot-out loss to Madagascar in the quarter-finals last Sunday. Although beating Namibia 4-1 during the week was a huge come back for Baxter’s side, a win over the Zebras would at least, undo their loss to Barea. For Major David Bright’s troops, they have had a great tournament so far as they bagged two wins out three in Group B, but lost to Zimbabwe in the quarter-final on Sunday. It was a cagey start at the iconic venue as the hosts enjoyed more time on the ball after 15 minutes, yet Ryan Moon could not direct his effort at goal from Lebohang Maboe’s delivery. Two minutes later, Bafana continued with good touches and Siphesihle Ndlovu also came close to opening the scores with a well struck half volley, but sailed inches wide. Moon was also set up by Maboe in the 36th minute with a delightful pass, but the Kaizer Chiefs striker was denied by Mwampole Masule from a tight angle. However, the deadlock was finally broken two minutes later when Motjeka Madisha converted with a glancing header beating Masule on his near post from Aubrey Modiba’s coss. 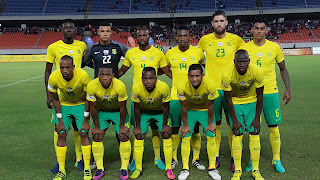 The visitors looked for an immediate response and put pressure on the Bafana defence, yet they failed to test Reyaad Pieterse in the opening stanza as they went to the tunnel trailing by a goal. Botswana came back from the tunnel with more hunger to find an equaliser and Onkabetse Makgantai beat Pieterse, but denied by the cross bar. Bright made changes in their attack as they looked to give Pieterse some work to do, but the defence did a great job in protecting the keeper in the last 15 minutes. Bafana sat back and brilliantly caught the Zebras on a counter and Maboe spotted Modiba who easily slotted home to double their lead. Although it looked like dead and buried in the last three minutes, substitute Lyle Foster attempted a shot from range, but the Orlando Pirates forward failed to direct his effort on target. With Botswana showing becoming sloppy at the back, Maboe stole the ball in the 89th minute and beat the oncoming Masule before passing the ball into an empty net.